This book was slow enough in its first third or so that I nearly put it down in frustration, but when it gets good it gets very good. It’s got some issues with exposition and pacing that are likely just due to its being a first novel, but there’s quite a lot to enjoy about it nonetheless. For one thing, it’s got a drop dead gorgeous cover (designed by Kathleen Lynch and illustrated by Ben Perini), and inside you’ll find an intriguing magic system, a resourceful (if flawed) heroine, and an interesting take on fantasy politicking, and if The Waking Land isn’t a great read, it’s still a more or less promising debut that sets up Callie Bates as an author to watch. Elanna Valtai has been raised like a daughter by the king who exiled her parents after a failed rebellion, but when the king is poisoned she finds herself on the run, forced to confront some unpleasant realities that she’s been kept ignorant of, and discovering parts of herself she didn’t know existed. It’s a solidly conventional fantasy set-up, part coming of age and part political intrigue, but Bates tweaks the narrative just enough to keep things somewhat fresh. Elanna’s attachment to her foster father and the way she identifies with her adopted country turn out to be an interesting exploration of something very like Stockholm syndrome, and there’s a lot of page time dedicated to Elanna’s feelings about her confused identity. It’s easy to follow Elanna’s growth from the sheltered girl who thought she’d come to terms with her childhood trauma to a girl learning that she didn’t even understand what had been done to her to a self-actualized woman who has resolved her inner conflicts and is ready to both forge her own path and work together with others to build a better future for their people. One thing I love about Elanna is that, though she’s not, in general, unlikeable, she’s written with very little seeming concern about likeability. Instead, while not written in a naturalistic fashion—it’s hard to have true naturalism in this kind of fantasy—she is allowed to just exist and have feelings without any attempts within the text to justify or make excuses for her worst tendencies. When Elanna is selfish or cowardly or uncertain, the text is nonjudgmental and, for a book with first person narration, nicely free of self-loathing. Elanna’s internal conflicts are rarely about whether she feels capable of achieving what she wants; instead, she struggles both with knowing what she wants for herself and with trying to figure out the best way to live up to her inherited responsibilities. That said, in early chapters, Elanna’s self-absorption and ignorance can be tiresome. It makes for a compelling and coherent character arc when she finally starts to grow up a little, and Elanna proves herself time and again as a staunch friend, loving daughter and loyal ally, but there are a solid hundred pages where she borders on being insufferable. On a more positive note, the setting and supporting characters are mostly strong. Bates has crafted a smartly imagined fantasy world with a sort of 17th century aesthetic and elements of French and what seems like Welsh (or some mix of Welsh, Scottish and Irish) culture. There’s gunpowder-based technology, extravagant palaces, salons with shade of the Enlightenment, and a democratic-revolution-minded rebellion in the works. The magic system is left somewhat ill-defined, but it’s also not overpowered, and none of the book’s major conflicts are resolved through solely mystical means. For a YA fantasy, naming conventions are reasonably good; “Elanna Valtai” is the fussiest name in the book, and the rest of the characters and places are named pronounceably and with consistency and good sense. There’s even some effort made at diversity, though it’s done in that weirdly subtle, vague way that seems calculated to be inoffensive to a presumed white audience. The biggest problem weighing down the story, however, is a lot of very clunky exposition (including a wholly unnecessary prologue) all of which is only made more unwieldy by the choice to tell the story in first person present tense. 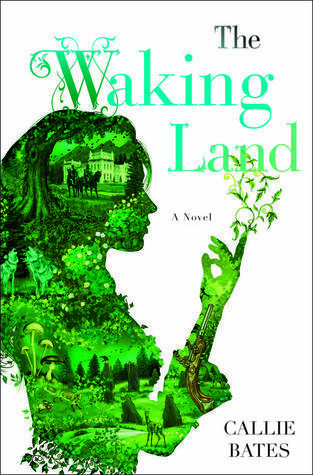 While this seems to be the reigning popular point of view for YA fantasy, Bates struggles to make it work here, especially in lengthy expository sections about Elanna’s background, the backgrounds of other characters, the history of the land and the political situation. Sadly, the earliest parts of this novel really are enough of a slog to deter many discerning readers; at 400 pages, The Waking Land feels much longer than it is, and there are faster and more evenly paced options for those without the patience to stick this one out until it gets better. This review is based on a copy of the title received from the publisher through NetGalley.